The domestic market for logs has had a very stable start to 2019 with no significant changes in log prices. Demand for sawn timber is ahead of this time last year. The only constraint to log supply is the production capacity in New Zealand. Due to the increases in AWG sale prices over January and February the PF Olsen Log Price Index increased $8 to $137 for February. The index is currently $9 above the two-year average, $11 above the three-year average, and $20 higher than the five-year average. Prices for domestic log sales in Quarter 1, 2019 are relatively unchanged from Quarter 4, 2018. Demand is strong as mills replenish stock after the Christmas holidays. Log supply has been strong with excellent weather around the country. Most mills report a solid start to 2019 with sales above this time last year. The fine settled weather in New Zealand is the likely cause of this solid demand. The Australian construction market has slowed with building consents down 25% over the last few months. This slow down in construction has started to show in reduced demand for construction timber. Sales into Asia have been patchy through the Chinese Lunar New Year, and demand is expected to increase later in February. The clearwood demand is stable although European sales are down slightly in Quarter 1 as one major buyer has reduced purchases as they approach the end of their financial year. This will pick up again in Quarter 2. At wharf gate (AWG) prices for logs delivered to ports around New Zealand increased on average 8 NZD and 5-6 NZD per JASm3 in January and February respectively. The price increases were across all grades. Some log exporters were able to increase prices more than other log exporters due to short term shipping advantages. (See Ocean Freight section later in this report). Log exporters are generally positive with their outlook for March AWG prices. Total softwood log stocks across China have increased slightly and are now approximately 3.1-3.3 million m3. Inventory levels increased from last month mainly as a result of increased arrival volumes from the US caused by delays in berthing in the Yangtze Delta ports due to bad weather last month. Increasing volumes of European spruce arriving by containers are competing strongly with radiata pine. Demand will obviously reduce over the Chinese Lunar New Year as the country celebrates the Year of the Pig and demand will pick up again as workers return to work. 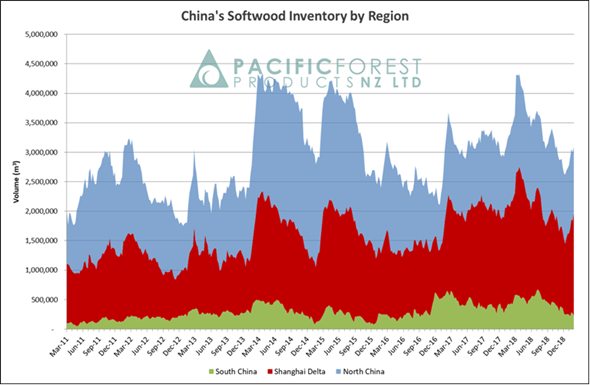 Exporters are not concerned about any rise in softwood inventory levels over this period. Log stocks are lower this year than they were before last year’s lunar new year holiday period. Indeed, softwood log stocks peaked over 5M m3 last April with no market issues. AWG prices in New Zealand dropped by 2-4 NZD then, but this was caused by increased ocean freight costs rather than any market movement. Adding to the overall reduction in log supply from the US, the government in the British Columbia region has announced plans to curb any export of logs. Currently logs are required to be processed domestically by law, but there are exceptions where it can be shown no fair domestic prices have been offered. New laws planned would make it harder to export logs in a bid to encourage more domestic processing. Increased log export fees could be introduced as early as the northern hemisphere summer. Tight bank funding and the LC availability situation continues to create issues and limit stock holding ability and forward buying capacity of most log importers. This is the single largest stumbling block to growth in the Indian log market in 2019. Radiata pine stocks have dwindled in Kandla as New Zealand log exporters only shipped on average 2-3 vessels per month between October and January. Market demand is quite high, and prices are following the aggressive China market trend. Most log exporters expect the Indian log market to remain steady until April 2019. Regular shipments of pine logs from South Africa and US have kept smaller importers well fed with stocks. The US southern yellow pine (SYP) substitutes suitably for radiata in the construction/formwork market segment, however, does not provide the same nailing ability as radiata logs from NZ and hence packaging oriented mills continue to seek New Zealand pine logs. South African pine also provides a partial substitution option but not in the same volume or quality as New Zealand radiata. In Tuticorin some aggressive competition in the last two months to sustain market share has led to some market price disparity. The latest vessel by one New Zealand exporter had a sale price of 154 USD per JAS m3 for A grade while another NZ exporter due to an earlier price commitment provided A grade at 144 USD per JAS m3 and this volume is still being moved from Tuticorin Port to mills. This has created disparity in the market and stocks are moving slowly. Some of the mills have resorted to operating at 50% capacity. The sawn timber market price continues to be Rs 511 per CFT, and the demand from the important packaging industry has been dull. The NZD has oscillated within the 0.67 and 0.69 range against the USD. Currency management by log exporters can offer competitive advantages. 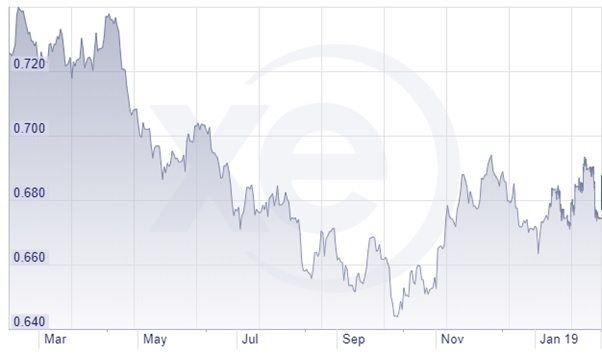 The Chinese Yuan (CNY) stabilised against the USD through December and appreciated over January. This has provided some assurance to the Chinese log buyers. Ocean freight rates are a big variable between exporters of New Zealand logs at the moment. 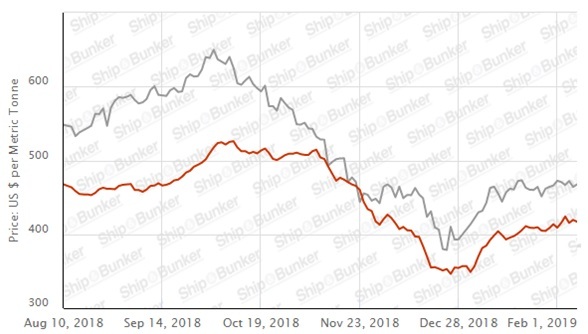 Rates have fallen again to be around 23-24 USD per JASm3 for an average ship undergoing two port loading in New Zealand and two port discharge in China. New Zealand log exporters continue to benefit from good availability of vessels because of the drought affected grain trade in Australia and rates for larger classes have been falling due to slowing global trade and this has a flow on effect on daily hire rates for handysize vessels. If exporters are fixing very short and hoping vessels will arrive when needed they can benefit from some very sharp rates to China round 20 USD per JASm3. 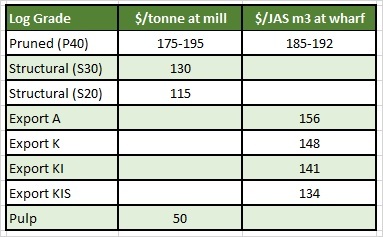 Freight Rates to India have reduced to 32-34 USD per JAS m3. 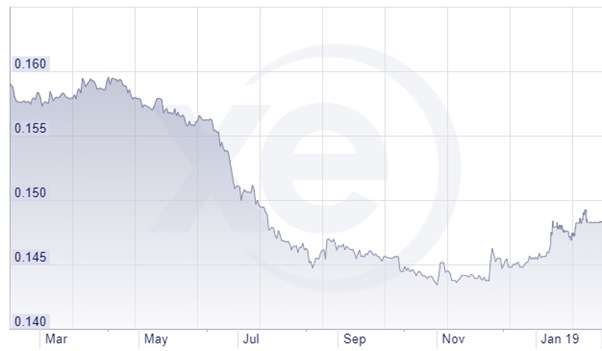 The graph of the BDI over the last year below shows the recent drop in the BDI. 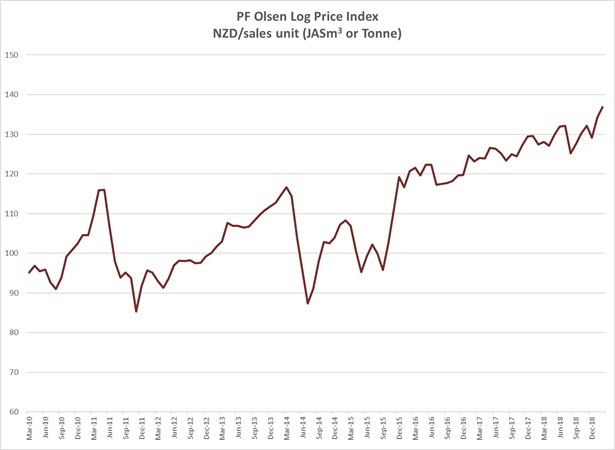 Due to the increase in the AWG sale prices the PF Olsen Log Price Index increased $5 in January and $3 in February, to a record $137 for February. The index is currently $9 above the two-year average, $11 above the three-year average, and $20 higher than the five-year average.